Samsung today accidentally gave the world a sneak peak at a smartphone that we’ve all pretty much known was on the way, and that phone is the much talked about Galaxy S4 mini. If you’ve always liked Samsung’s Galaxy S4, but not it’s gigantic proportions or equally large price, then you appear to be in for a spot of luck today for there may be a remedy to your predicament. As has been rumored on and off for some time now, Samsung appears to be set to bring a new smartphone to the market, and it’s going to feature the Galaxy S4 moniker whilst being a bit more manageable both in the pocket, and in the wallet. The currently unannounced Galaxy S4 mini today saw itself get an outing of sorts after one of the people in charge of the company’s app website accidentally added it as a compatible device. Clearly someone didn’t get the memo when Samsung was trying to decide when to announce its smaller Galaxy S device! 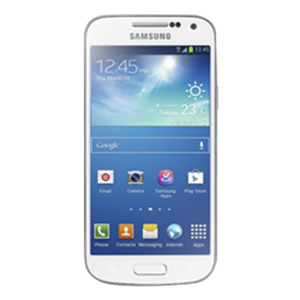 At the time of writing, the ‘Galaxy S4 mini’ listing is still up on Samsung’s official site. 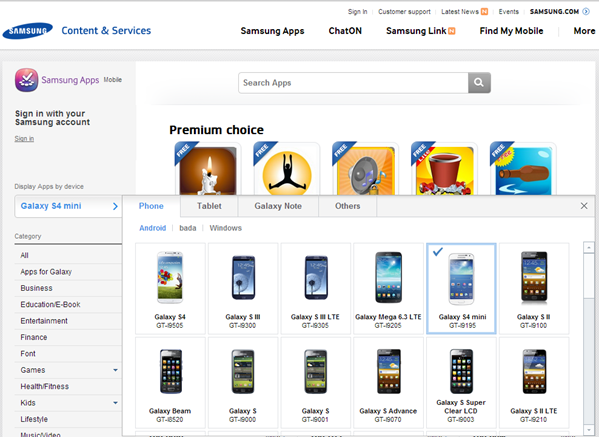 Navigate to apps.samsung.com/venus/main/getMain.as, select United Kingdom as your country, click on Display Apps by device menu and you should see an option for Galaxy S4 mini, as shown in the screenshot below. The S4 mini, or GT-I9195 to its friends, is expected to be similar in appearance to its bigger brother except, well, smaller. That’s certainly how the image on Samsung’s website depicts the smartphone, and it would be in keeping with the rumors we have been hearing for some time now. It’s under the hood that things start to differ for the Galaxy S4 mini. Obviously it is still unannounced, but it is expected to feature a 1.6GHz dual-core CPU, 4.3-inch Super AMOLED 960×540 display and either 1GB or 2GB of RAM depending on whether the device packs 4G LTE or not. Expect Android 4.2.x to be running on the S4 mini and an 8-megapixel camera to be hiding around the back. Storage wise we’re talking 32GB of internal memory, assuming the rumors are correct of course. While Samsung hasn’t officially announced the Galaxy S4 mini yet, we suspect an announcement may not be too far off, especially now the cat has well and truly been let out of the bag!